Polypropylene Handles have built-in microbial product protection., which inhibits odor and stain-causing bacteria, mold and mildew. 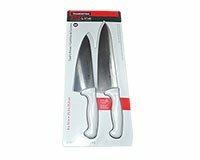 Although this protection is good for the life of the knives, it does not protect against foodborne bacteria. Always clean knives thoroughly after each use.